Direct Selling News Global 100 is an exclusive ranking of the world’s largest direct selling companies. It is a collective effort to show the impact and potential of the $183.7 billion direct selling channel. It gives us a chance to recognize the leading companies in direct selling today. The annual event celebrating the Global 100 took place on April 19, 2017, at the InterContinental Dallas. Közzétette: Direct Selling News – 2017. április 19. 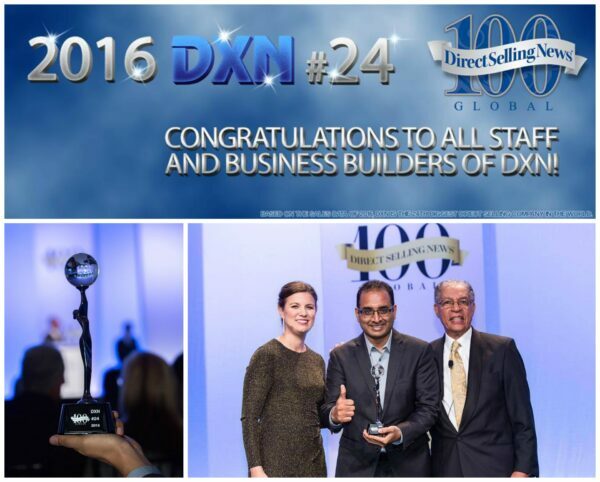 DXN is the 24th biggest direct selling company again according to the newest DSN list. Here you can find the ranking for the 2017 DSN Global 100 (based on 2016 revenues). This annual list contains the top revenue-generating direct selling companies in the world. DXN continues to maintain the 24th ranking globally, but with an increased Global Revenue of $ 927 million for the year 2016 … Congratulations to all !!! Közzétette: Prajith Pavithran – 2017. április 19.